The MuxLab Stereo Audio Balun allows an unbalanced line level stereo audio from an analog audio source to be connected up to 5000' (1.5 km) away using Cat 5e/6 (UTP) cables. It is designed for audio applications with a midrange audio frequency response. Eliminating the use of coaxial cables, the Stereo Audio Balun allows audio equipment to be connected or moved within a structured cabling environment. 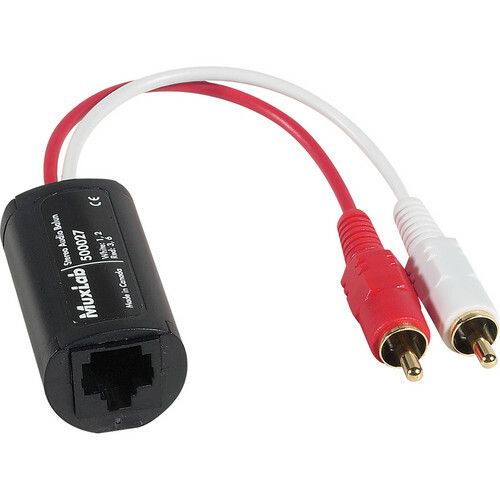 It has a common mode rejection of 60 dB at 1 KHz, and features color-coded RCA cable leads for an easy and error-free connection to an audio source. Box Dimensions (LxWxH) 5.3 x 4.3 x 0.6"
Stereo Audio Balun is rated 3.0 out of 5 by 2. Rated 1 out of 5 by Anonymous from Not for high quality audio We tried these baluns. The sound quality is horrible. It only carries the midrange frequencies only. Not Hi-Fi at all.